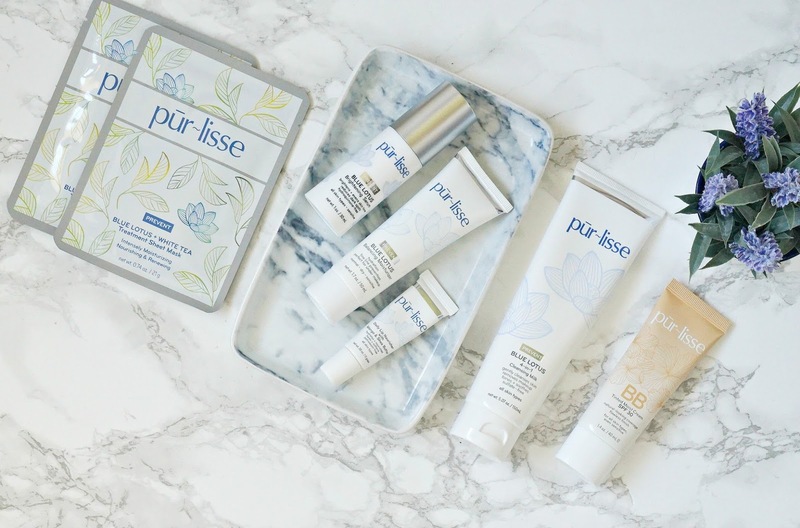 A few months ago, I hadn't heard of the brand Pur~lisse but then it began to pop up on some of my favourite blogs, which naturally made me curious about it. It is different from a lot of other skincare brands that I use because it combines Asian skincare secrets with French skincare technologies. The brand was created by Jennifer Yen, who as an actress and model, found that her skin was suffering negative effects of wearing heavy makeup that was required for her job. It is a cruelty-free brand and is deemed as suitable for sensitive skin so I was delighted when Pur~lisse got in touch with me to ask if I wanted to try some products. This post isn't sponsored and the opinion shared is entirely my own. I was sent a number of products from the Blue Lotus range, which is full of anti-oxidants to brighten the skin whilst also calming it - perfect for dry, sensitive skin like mine. I was also sent their BB Tinted Moisturiser Cream with SPF 30, which I want to talk about first as it is the perfect base product for this time of year. I am not the hugest fan of tinted moisturisers usually because any I have previously tried, offered little or no coverage and whilst I don't like full coverage base products, I do like light to medium. This product, however, is a beautiful base product. It has the perfect texture - not too liquid but not overly creamy, which means it applies and blends beautifully on the skin and it gives a good light-medium coverage. The finish is neither matte nor dewy - a satin, natural finish and it is so lightweight that I can't feel it on my skin. I don't need to wear a primer with this (unheard of for me!) and it lasts a good 7/8 hours on me. It doesn't cling to any dry patches nor does it go patchy or look greasy at the end of the day. It is basically the perfect Spring/Summer base. I have the shade Light, which is unfortunately too light for me but I just use from bronzer to make it work. It comes in 3 shades - light/medium and dark and is priced at $36. Now on to skincare! The Blue Lotus 4 in 1 Cleansing Milk is said to remove makeup, cleanse, tone and soothe the skin. I have to say that I don't agree that it removes makeup - it literally didn't budge my mascara at all, however as a second cleanse or (my preference) as a morning cleanse, this gets the thumbs up from me. It is a thick, quite sticky milk, which I massage into damp skin before emulsifying with warm water and rinsing. It leaves me skin feeling soft, soothed and clean without being stripped. $36. My favourite product of all of the skincare products is the Blue Lotus Brightening Serum. This serum contains Vitamin C, which brightens the skin and Lupine Peptides to promote luminosity, as well as a host of other ingredients, which protect and soothe the skin. I have found this particularly helpful in fading the scars from a horrendous breakout that I suffered around 6 weeks ago and it also helped to reduce my skin's inflammation after a bad reaction to a product. It is an all round winner in my eyes - perfect for anyone who suffers from sun pigmentation, inflammation, acne-scarring and general dull skin. $76. I was also sent a moisturiser from the Blue Lotus range - the Balancing Moisturiser. This is a gel moisturiser, which unfortunately is not quite rich enough for my Sahara-like skin - my skin just needs a product with a lot more 'slip' in it, however if you have normal, combination or just slightly dry skin then this would work for you. It feels very cooling and soothing on the skin - again due to the Blue Lotus extract but also the inclusion of White Tea but my skin needs more hydration. $55. Now back to another product that I love! The Blue Lotus + White Tea Treatment Sheet Mask is a real treat for my skin. I'll get the only negative out of the way first - the mask doesn't really fit my face but apart from that, this is a really beautiful product. It is packed with anti-oxidants and minerals, which completely drench my parched skin, whilst also soothing it. I tend to leave it on for at least 20 minutes (maybe longer) before removing and massaging the excess product into my skin, which leaves it smooth, hydrated and extremely comfortable. It is the ideal pick me up for skin before applying makeup or for a difficult skin day. I will definitely be buying more of these. $8 for one of $36 for a box of six. The final product is a lip balm - Daily Lip Nourisher with Mango & Shea Butter. This is a really brilliant lip balm, which keeps my lips very soft and moisturised and all lip products apply beautifully over it. It is now a staple on my bedside table. $16. Have you tried any Pur~lisse products? Have any of these tempted you? I would love to hear in the comments below! All products are bought by me, unless otherwise stated. All of these products were sent to me from Pur~lisse but this post is not sponsored. Opinion is always my own.